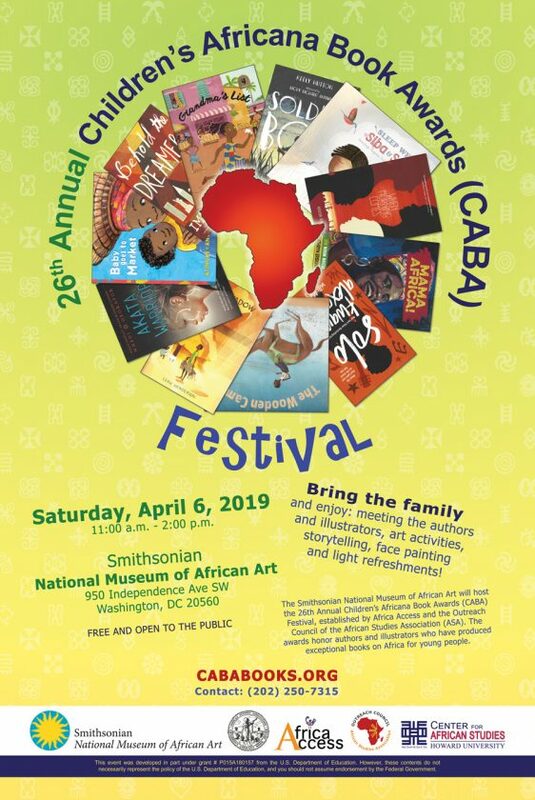 The Smithsonian’s National Museum of African Art will host the 26th annual Children’s Africana Awards and Book Festival Saturday, April 6, from 11 a.m. to 2 p.m. The awards and book festival are presented each year to recognize the authors and illustrators of the best children’s and young adult books on Africa published or republished in the U.S. The awards were created by the Outreach Council of the African Studies Association to encourage the publication and use of accurate, balanced children’s materials about Africa. This event is free and open to the public. This year’s festival will offer Book to Art activities for ages 4 and up in the museum’s pavilion and the workshop from 11:00 a.m.–2 p.m. There will be a panel discussion on the Mezzanine level from 11:00 a.m.–1 p.m. An African percussion workshop inspired by 2019 book winner “Mama Africa, How Miriam Makeba Spread Hope with Her Song” will take place throughout the day. The Children’s Africana Book Awards are presented in three categories: Young Children, Older Readers, and New Adult (books marketed to adults but suitable for mature teens). Baby Goes to Market, Atinuke and Angela Brooksbank (illus). Candlewick, 2017. Mama Africa, How Miriam Makeba Spread Hope with Her Song, Kathryn Erskine and Charly Palmer (illus.). Farrar Straus Giroux, 2017. Grandma’s List, Portia Dery and Toby Newsome (illus.) African Bureau Stories, 2017. The Wooden Camel, Wanuri Kahiu and Manuela Adreani (illus). Lantana, 2017. Sleep Well, Siba & Saba, Nansubuga Nagadya Isdahl and Sandra Van Doorn. Lantana, 2017. When Morning Comes, Arushi Raina. Tradewinds, 2017. Solo, Kwame Alexander with Mary Rand Hess. Blink, 2017. Akata Warrior, Nnedi Okorafor. Viking, 2017. One Shadow on the Wall Leah Henderson. Simon and Schuster, 2017. Soldier Boy, Keely Hutton. Farrar, Straus and Giroux, 2017. Behold the Dreamers, Imbolo Mbue. Random House, 2017. The public will have an opportunity to meet the authors and illustrators of the 2019 award-winning books during a book signing on the Mezzanine, sublevel one, from 11a.m.-1:15p.m. Established in 1991 by the Outreach Council of the African Studies Association (ASA), the Children’s Africana Book Awards are presented annually to the authors and illustrators of the best children’s and young adult books on Africa published or republished in the U.S. The awards were created to encourage the publication and use of accurate, balanced children’s materials about Africa. And to recognize literary excellence and acknowledge the research achievements of outstanding authors and illustrators. Support for the Children’s Africana Awards and Book Festival is provided by Africa Access, the Center for African Studies at Howard University and the National Museum of African Art.